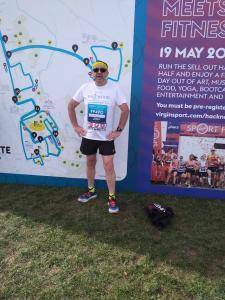 Dave Street, Commercial Coordinator, has recently ran the Oxford half marathon for his chosen charity – The Haywood Foundation. With an impressive time of 2 hours, 22 minutes, 7 seconds (in his first ever half marathon), Dave completed the run and was greeted by his wife Ruth at the finish line. Dave took up running 18 months ago and has since developed a strong passion for running and has made great “strides” during this time and in preparing to run this half marathon. 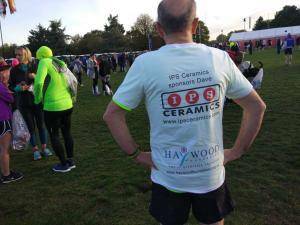 Everybody at IPS Ceramics are extremely proud of Dave for what he has achieved. The Haywood Foundation are a charity that specialise in providing support for arthritis and related conditions in the local community. The charity was chosen by Dave, due to it being close to his heart as they helped and supported his brother in his time of need. Dave has so far raised £423 for the Haywood Foundation, which has exceeded the original £200 target he set for himself when he announced he would be running. He is extremely thrilled with the support, especially as the money is being donated to such a fantastic cause. If you would like to support the cause and foundation please use the link below.